Wow! Can you believe summer is over? 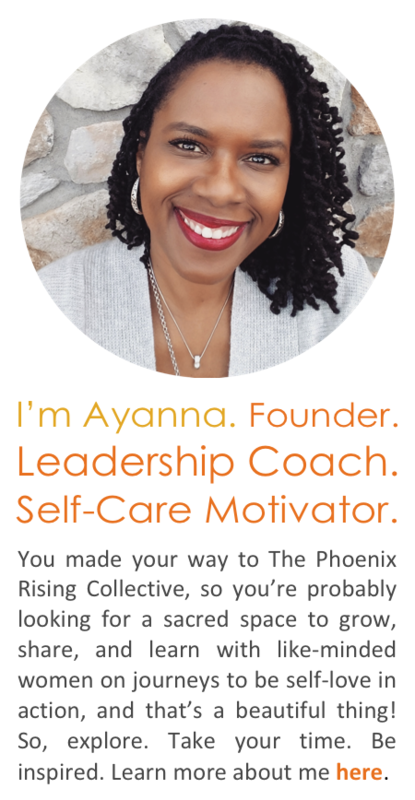 I simply cannot believe how fast it has gone by and that I’m nine months into contributing to The Phoenix Rising Collective. The PRC is inspiring, empowering, and calming, so I hope that my articles have inspired you to incorporate health and wellness into your life resulting in a calm and healthy mind, body and soul. A few weeks ago I had the opportunity to present at The PRC’s The Fullness of Me workshop. I enjoyed meeting and getting everyone up and MOVING! We had a blast, and I mentioned to the group that physical well-being is directly related to our mental well-being. My goal is to empower all of the workshop attendees and our readers to incorporate movement into their lives. I love it; I really truly do. I shared two things with the group: 1) I grew up around fitness. I tagged along was dragged along to aerobics classes, gyms and seminars as a kid. As a very young child, my cousin and I would help her mom (my super fitness aunt) lead her classes. And 2) I am a busy working mom of three young children (10, 8, and 5) with an equally demanding husband, and I’m working on a master’s degree. My objective in sharing these “Megan Facts” is to motivate you to move to show your children, grandchildren, nieces, nephews, students, etc. how important it is to be healthy and how to be physically and mentally fit. Yes, this means leaving the kiddos for an hour in the evening, making the husband or significant other fend for themselves, leaving work on time, or letting the laundry and dusting pile up, but it is well worth the hour of freedom. You will come back refreshed, and you’ll have taught the little ones and others you love in your life that your physical well-being matters. The reason for telling you about my children, husband and job is that I AM BUSY – so busy, crazy busy, I-want-to-scream-and-run-and-hide busy. I have three children in three different sports plus my girls are in dance classes. My husband works evenings and I manage a global program during the day, BUT I make time for myself and my body. It is my time and I don’t feel guilty about it. We’re all busy in some way, but please make time for your health now; otherwise, you will spend the latter part of your life being busy with doctor’s appointments. Remember every movement counts. You don’t have to spend hundreds of dollars per month on a gym membership or equipment. Our body weight is a wonderful tool and will strengthen you and give you the resistance you need. You can incorporate just 10 minutes a day of anaerobic exercise into your life a few times a week or a 30 to 45-minute workout two days a week and achieve wonderful results and increased energy. Walk up and down the steps in your house. Grab a chair and sit down and then stand up, repeat. While you’re in the kitchen waiting for the microwave, place your hands on the counter and do push-ups; jog in place while your kids are asking their millions of questions. Break out into Zumba when your favorite song comes on Pandora. While you’re reading, work on stretching. During commercial breaks, do jumping jacks, jump squats, squat walks, bear crawls, lunges, high knees, fast feet. Do something to get the blood flowing. I hope I have encouraged you to incorporate movement into your life; I hope I have empowered you to know that YOU CAN DO THIS with whatever time or money you have. It will bring peace and calm to your mind, body and spirit. Megan Weidner is a fitness coach and environmentalist in the Akron/Canton, Ohio area. She manages a global sustainability and corporate responsibility program for a large multinational company; her areas include environmental compliance, social equity, community engagement and health and wellness. Megan is also devoted to Rock. It. Fitness., her fitness and natural skincare business. She is committed to making the world a better, more environmentally friendly and healthier place through motivation and education. She is certified through AFAA and Tabata Bootcamp. She has a B.S. in Soil, Environmental, and Atmospheric Science (University of Missouri), a Graduate Certificate in Environmental Management and Policy (University of Denver) and an M.P.A (University of Missouri). She lives in Green, Ohio with her husband and three kids. Read her latest posts. 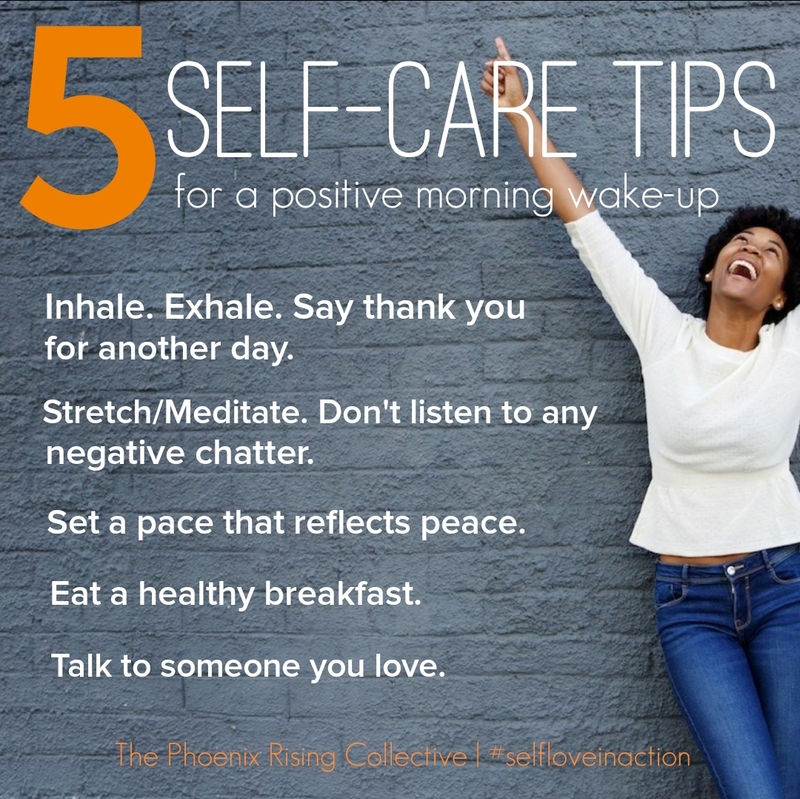 Categories: Self-Care + Personal Growth | Tags: balancing time, exercise, health and fitness, health tips, healthy living, self-care, self-love, the phoenix rising collective, well-being, wellness, women and health | Permalink. For me, self-love is very much intertwined with self-acceptance. Part of this is simply being my authentic self instead of trying to be the person others want or expect me to be – something I’ve struggled with in the past. Sometimes it means accepting my limitations and not expecting perfection. My best is enough. I’ve learned to set boundaries and not take on too much, just to make someone else happy. Sometimes you have to say no. At the same time, I think self-love is partially what enables me to push myself to achieve. I grew up knowing I wanted more for my life than I felt I was being offered. Because I love myself, I have worked hard to accomplish many goals. I’m proud of who I am and what I’ve accomplished so far, and I love myself enough to continue to strive for more. I put a lot of emphasis on mental self-care. I try to keep my self-talk positive. 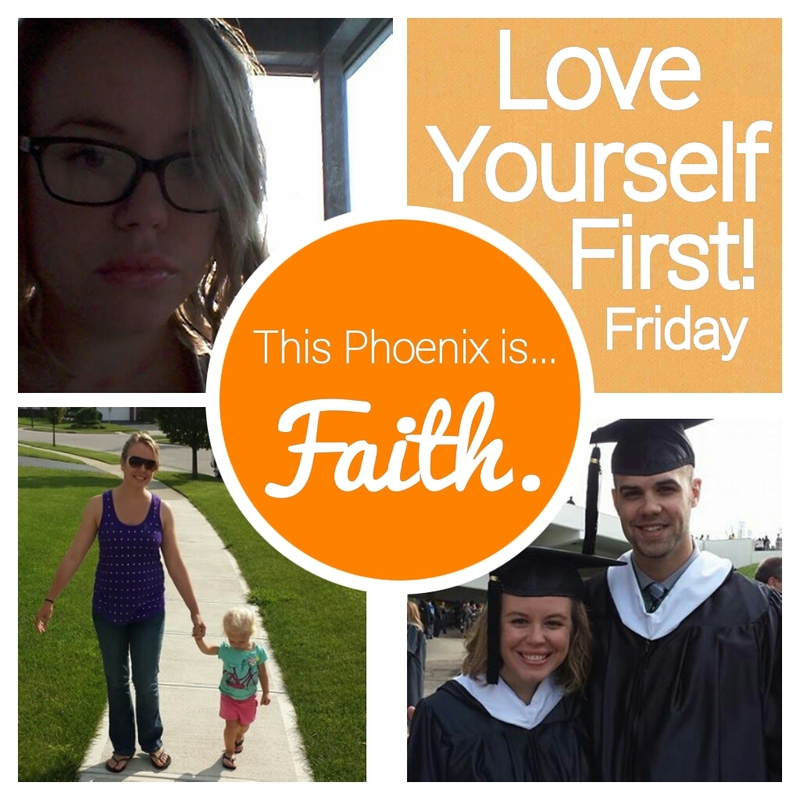 If I wouldn’t say something to a friend or to my daughter, why should I say it to myself? Speaking of friends, I try to nurture my relationships and surround myself with positive influences as much as possible. My friends are a priority in my life and I feel lucky that they make me a priority, too. I think that a good laugh or conversation with a friend can soothe the soul like nothing else. I love to eat healthy (and delicious) food, and drink lots of water. I don’t believe in “dieting” or depriving myself of food. Instead, I try to incorporate as many fruits, veggies and whole grains as possible- and when I want something less healthy I eat it, too. I’ve found that the larger variety of healthy foods I eat, the more I enjoy making healthy choices and love to try new recipes. I hate the way society has taught so many women and girls to count every calorie and associate food with being “good” or “bad.” I try to eat for longevity and health – not what society says I should look like. I try to work physical activity into my life, although in my current state (month 9 of pregnancy) I have been slacking. I’m not a person who enjoys traditional exercise and I hate running, so I have to find ways to make being active interesting for me. I really enjoy taking long walks (especially with my family). I also like participating in classes at my gym, like yoga or Zumba. I really want to get a bike, too! Anything that feels more like an adventure or experience rather than work is right up my alley. Finally, I make sleep a priority. I recently heard someone describe sleep as the only basic human need that we tend to delegitimize or look at as a weakness. Most nights I am asleep not long after 10 p.m.
As a mother with a full-time career outside of the home, I face many demands and really have to work at balance. There have been days when I cried after dropping my daughter off at the sitter’s in the morning and there have been days when I cried when I had to leave a work meeting early to pick her up. Not many of my co-workers have children (and most of those who do have much older children), so there have definitely been times when I worried about how my commitment outside of work as a mother impacted perceptions of my job performance. There have been times that I felt guilty for being away from my daughter during the day. At the same time, I enjoy and am proud of both aspects of my life, so I’ve learned to allow myself to embrace the positive feelings that both working and being a mother bring into my life and let go of the negative feelings of self-doubt or not being “enough.” I show myself love by giving myself permission to focus on the task at hand – whether work or being with my daughter- without guilt. It helps having an awesome and supportive partner (my husband, Matt). Motherhood has actually had a strong impact on my self-love in a lot of ways. I think one of the things I was afraid of before becoming a mother was losing a sense of myself. Instead, I’ve discovered a lot about myself that I didn’t know before. Sometimes I’m amazed at what I’m capable of. The amount of love I have for my daughter has given me confidence that I didn’t know I had. I make better choices because I know she is constantly watching and learning from me. Also, some of the things I love most about her are traits that I can also see in myself. How can I not love the things we have in common? Simple gratitude. I am more grateful than I can express for all the beauty in my life. It really is reciprocal: The more grateful I am for my life, the more I love myself. And the more I love myself, the more grateful I feel. Categories: Love Yourself First! 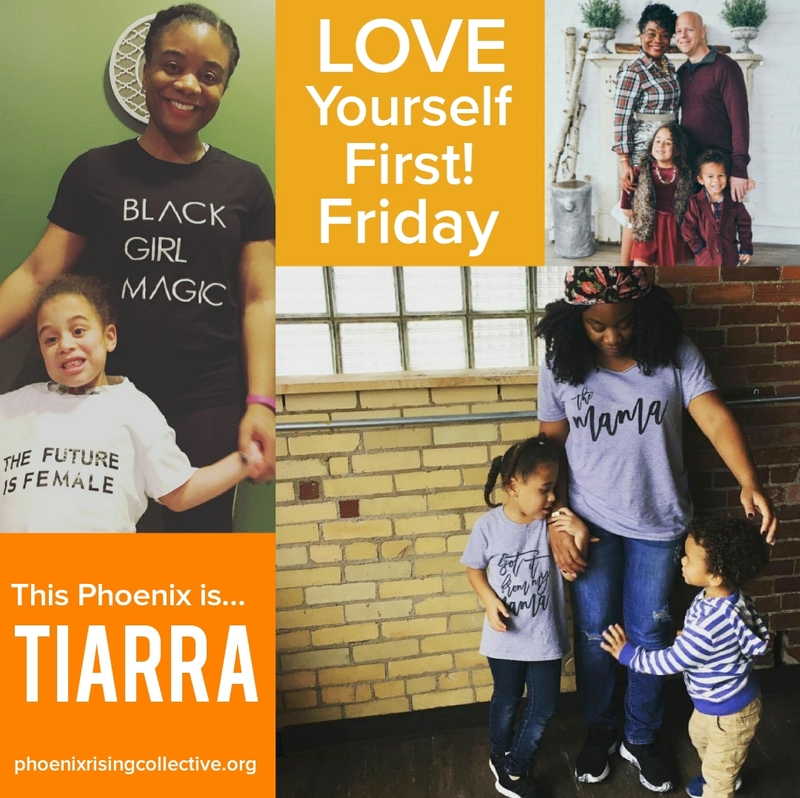 Friday | Tags: gratitude, intentional living practices, Love Yourself First, mindfulness, motherhood, personal growth, self-acceptance, self-care, self-esteem, self-love, the phoenix rising collective, well-being, wellness, whole living, women and wellness, women's empowerment, work life balance | Permalink. 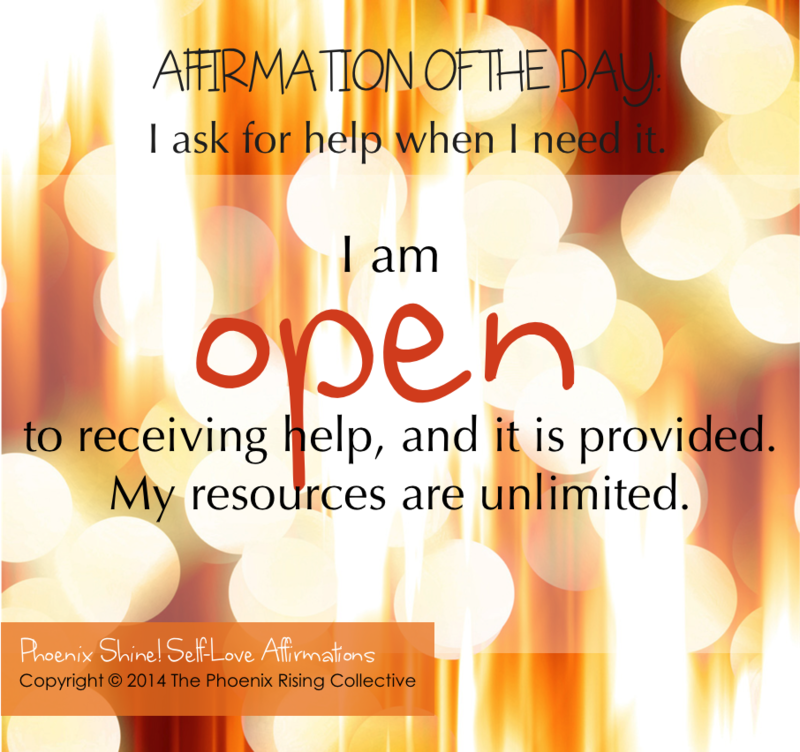 AFFIRMATION OF THE DAY: I ask for help when I need it. Don’t be afraid to ask for help! And if you are, ask anyway. Knowing that you can’t always go it alone or pick up the pieces on your own is a part of being in tune with who you are and honoring what you need. Asking for help strengthens the courage muscle. It is self-care, so be open to it in diverse forms. Expand the resources available to you and create abundance. You deserve it. Categories: Affirmations | Tags: affirmation of the day, inspiration, intentiona living, positive affirmations, self-care, self-esteem, self-love, the phoenix rising collective, well-being, women and self-esteem, women and wellness | Permalink. How are you preparing for 2014? Have you written your goals for the new year? What about creating a vision board? Writing and visualizing what you want is an important part of intentional living – healthy steps toward creating the happiness you desire! Make time for positive practices that help manifest the experiences you deserve to have. EXTRA TIP: Plan a Vision Board Brunch. Invite your closest sister-friend(s), one or two, over for a good meal. Pull out the old magazines and get creative! Share your thoughts about what you want for 2014 and commit to supporting one another throughout the year. Happy Tuesday. Be self-love in action! Want more on goal-setting and making positive change? Read this article from Simone and Aisha, our Life + Style contributors. Categories: Affirmations | Tags: goal setting for the new year, goal-setting, intentional living, intentional living practices, self-care, self-care tips and inspiration, self-love, vision boards, well-being, whole living, women and wellness | Permalink.